TO DONATE TO SUPPORT OUR TNR PROGRAMME, YOU CAN PAYPAL ANY AMOUNT TO TNRAVSALLAR@GMAIL.COM. THANKS SO MEOWCH! Anyone who has ever taken part in an animal rescue operation can tell you that neutering the animals is the most crucial course of action to keep the existing stray cat or dog population from growing uncontrollably and thus ensure these animals can be looked after and, where possible, offered a future in a good home, as a respected family member. Although our resources don't enable Manuela to catch animals for "TNR" ("Trap Neuter Release") cats and dogs every day, we do our best to catch as many animals as possible and take them to Dr. Osman's clinic (find out more about the clinic on the Our Partners page) to be neutered and, if their adoption can't happen at the same time or the animal is really too feral to be happy as a family cat or dog, released in their own territory, minus their ability to multiply. It's a well-known fact that a neutered cat or dog is less likely to be run over while seeking a mate, to get into fights and to be tormented by hormonal behaviour, too. 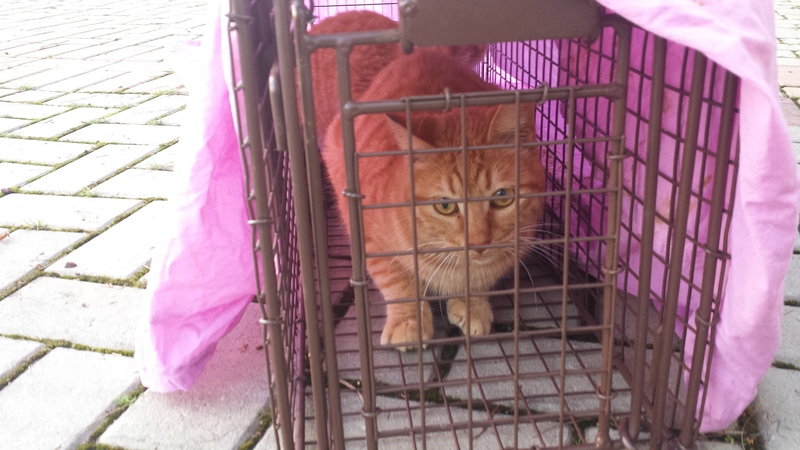 A volunteer, or staff from the vet clinic, will typically use a cage, a trap or a catcher (a special net) to catch cats. Once securely in their cages, they are taken to the clinic, a 30-minute ride south of Avsallar, and they are neutered using the state-of-the-art facilities of the clinic. A day or two later, they are brought back to their original spot and left to continue living their life as usual, except with fewer risks and a calmer behaviour. Animals caught, neutered and released are marked with the universal mark of neutered animals, the clipped ear. Sadly, some locals are against neutering animals as they believe it to be against their religious precepts, so we try to educate people to the rational benefits of neutering these street animals. If you agree with us that TNR is a good way to help the animals of Avsallar, please consider donating to our fundraisers for this purpose and/or look into going to help Manuela and Dr. Osman on the ground for a few days or weeks! An extra pair of hands goes a long way and can make all the difference in the number of new litters of kittens and puppies each season. Neutering represents a cost that can only be covered if people contribute financially to our efforts. The dogs are sometimes neutered by the local authorities and taking them to the clinic is more of a challenge for Manuela than the cats as dogs are not allowed on the local bus link, as opposed to cats, but whenever possible and needed we also step up to neuter them, of course. TO DONATE TO SUPPORT OUR TNR PROGRAMME, YOU CAN PAYPAL ANY AMOUNT TO TNRAVSALLAR@GMAIL.COM. MEOWNY THANKS!